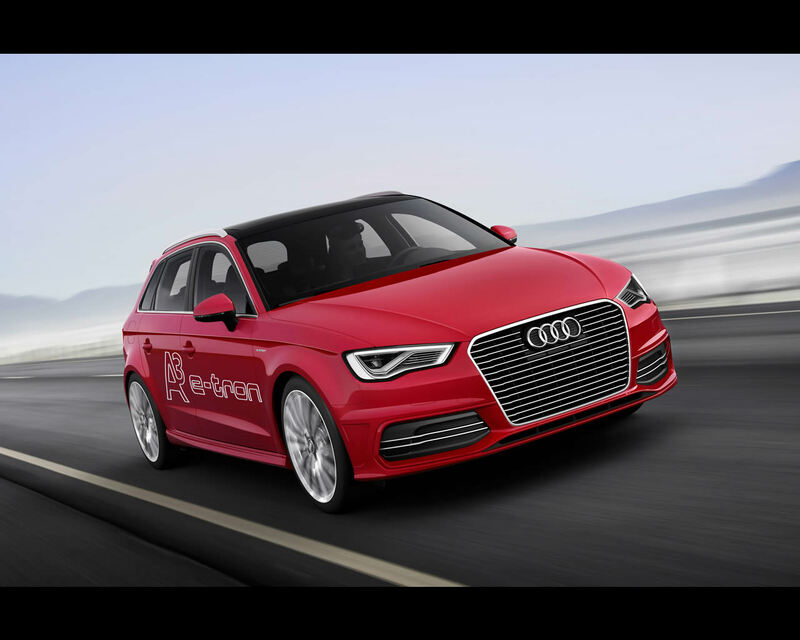 Audi is working intently to electrify the drivetrain using plug-in hybrid technology. 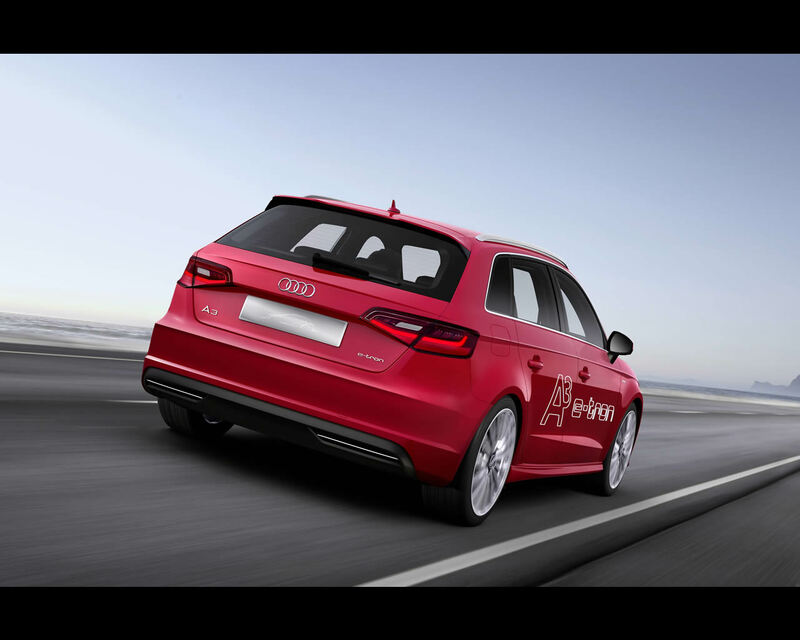 The brand with the four rings is showing the Audi A3 Sportback e-tron at the 2013 Geneva Motor Show. With 150 kW (204 hp) of system power and 350 Nm (258.15 lb-ft) of system torque, sporty performance is guaranteed. The A3 Sportback e-tron is a true Audi. It sprints from 0 to 100 km/h (62.14 mph) in 7.6 seconds on its way to a top speed of 222 km/h (137.94 mph). According to the ECE standard for plug-in hybrid automobiles, the five-door model consumes on average just 1.5 liters of fuel per 100 km (156.81 US mpg), which corresponds to CO2 emissions of 35 grams per km (56.33 g/mile). In purely electric mode, the Audi A3 Sportback e-tron achieves a top speed of 130 km/h (80.78 mph) with a range of up to 50 km (31.07 miles). The Audi A3 Sportback e-tron uses the highly efficient concept of a parallel hybrid. The combustion engine is a modified 1.4 TFSI, which develops 110 kW (150 hp) and 250 Nm (184.39 lb-ft) of torque. The TFSI operates in tandem with an electric motor that generates 75 kW and 330 Nm (243.40 lb-ft) of power. The disc-shaped electric motor is integrated into a newly designed six-speed e-S tronic, which transfers the power to the front wheels. The two powerplants complement each other. The electric motor develops peak torque from start to around 2,000 rpm, and the TFSI’s maximum pulling power is available in a range from1,750 to 4,000 rpm. 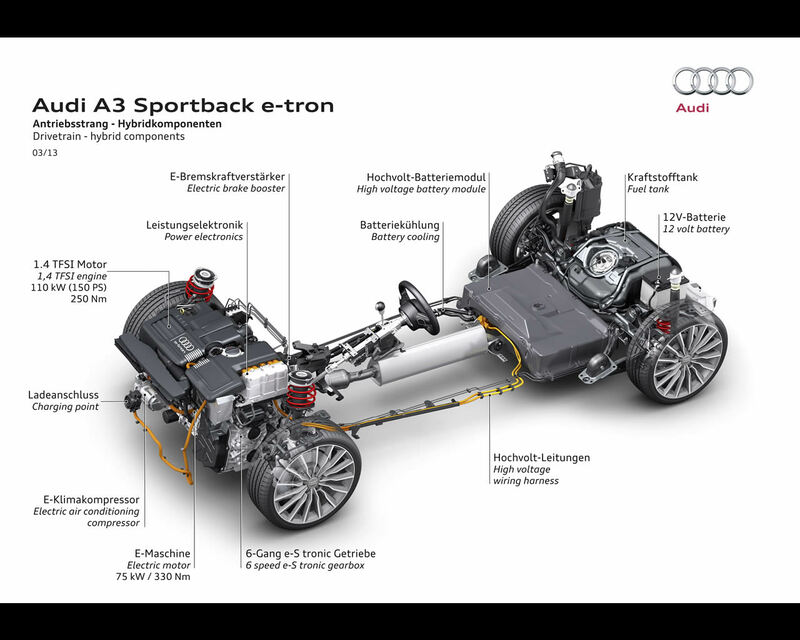 The Audi A3 Sportback e-tron’s energy store is a lithium-ion battery system installed in a space-efficient, crash-protected location in the floor, beneath the rear bench seat. The high-voltage battery, inside a housing made mainly from aluminum, has a capacity of 8.8 kWh. It comprises eight modules with a total of 96 cells. in the optimum temperature range. This sophisticated technology is key to the power and stamina of the electric drive unit, which remains available at low ambient temperatures. 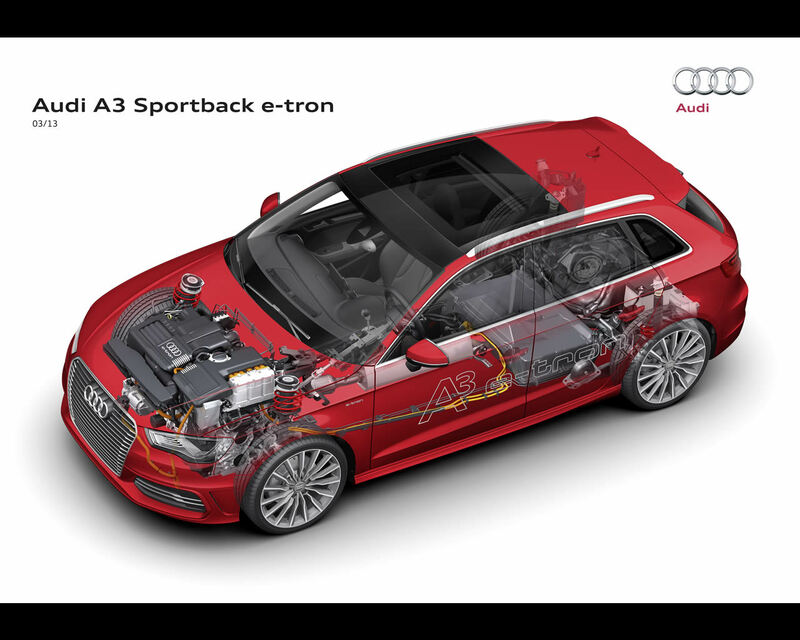 The power electronics are housed in the engine compartment of the Audi A3 Sportback e-tron. These convert the direct current from the battery into alternating current to power the motor. The compact unit, with integral DC-DC converter to supply the 12V electrical system shares the same cooling circuit as the battery and charging device. 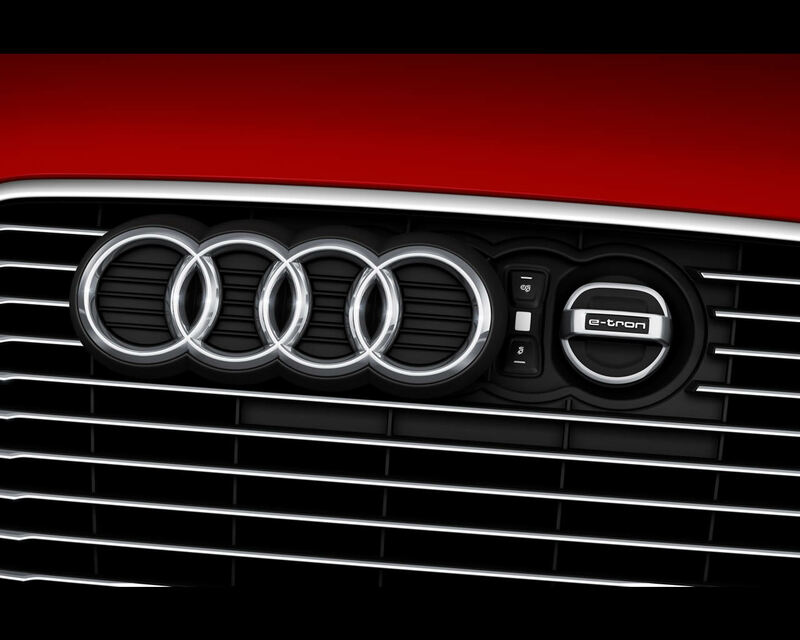 The charging connection is located behind the four rings in the radiator grille; the charging socket, like the TFSI engine, sports an e-tron badge. The high-voltage battery can be fully charged in around two and a half hours with a 3.6 kW charger. 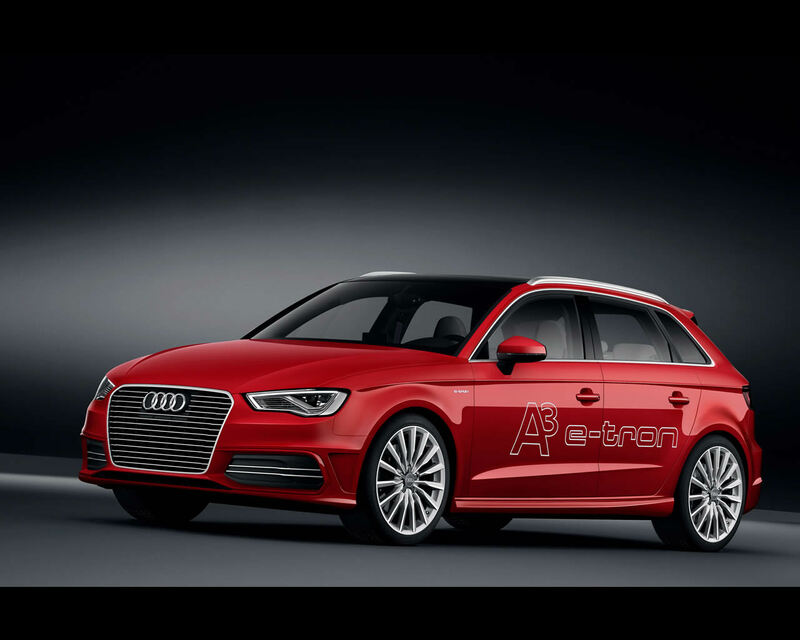 All relevant components within the high-voltage network of the A3 Sportback e-tron have no conductive connections to other parts of the vehicle. In the event of the belt tensioners or airbags being activated in an accident, the system is immediately disconnected from the power supply. The air conditioning compressor has a high-voltage electric drive; an electric auxiliary heater supports the heating function for the interior. The vacuum brake servo has an additional supply connection served by an electric vacuum pump. The hybrid management is tuned responsively with the electric motor. Up to moderate braking forces the powerful electric motor, now operating as an alternator, supplies most of the retardation and recovers much of the energy expended so that it can be channeled back into the high-voltage battery. The wheel brakes only become active if the driver presses the pedal more forcefully. The Audi A3 Sportback e-tron can be driven with just the combustion engine, just the electric drive or in hybrid mode. Even in electric mode it offers powerful acceleration without the need to engage the TFSI. The driver can choose to have both powerplants active at the same time (“boosting”). When the driver lets up on the accelerator, they both deactivate temporarily (“gliding”). In this way, engine braking torque is eliminated and efficiency increases. Three driving programs are selected using the EV button and the e-tron’s selector lever. The EV characteristic map covers the electric mode; the D program makes the A3 Sportback e-tron run especially efficiently, and in the S plane it is notably sporty. 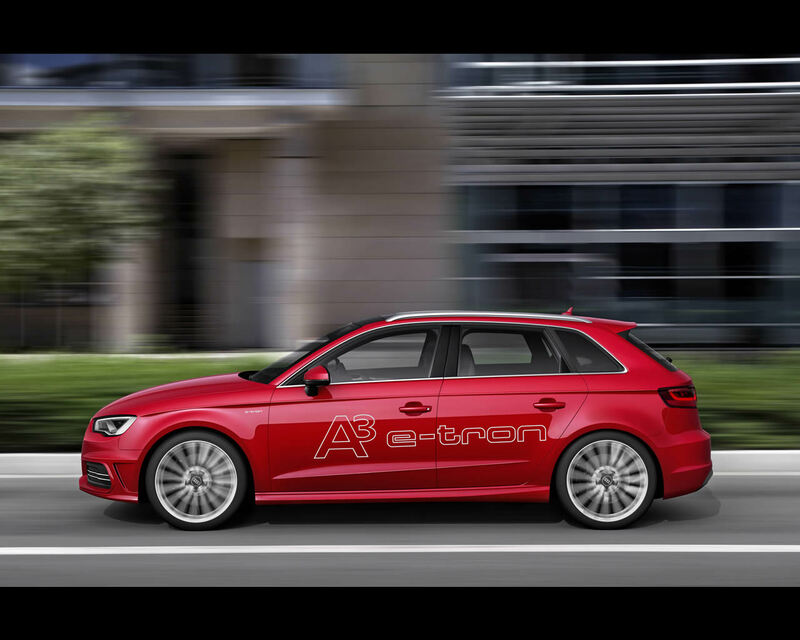 The Audi A3 Sportback e-tron display concept supplies precise information of the drivetrain status. The powermeter in the instrument cluster replaces the conventional rev counter and shows overall system power. The instrument cluster also includes a charge status display for the battery. 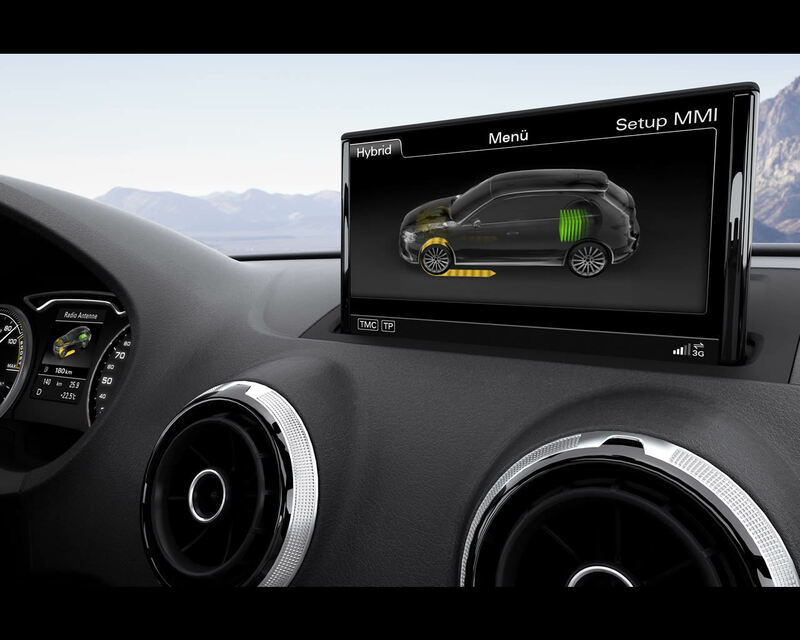 The driver information system’s color display and the MMI navigation monitor indicate the power flows in the drivetrain, the operating ranges and the consumption figures for electricity and gasoline. Audi is planning a whole portfolio of new online services for its electrified vehicles under its Audi connect umbrella policy. These will enable the driver to activate and monitor a whole raft of functions such as charging processes and pre-conditioning of the interior climate conveniently from their smart phone. The ergonomic interior of the A3 Sportback e-tron has an uncompromisingly high-quality finish. The interior is finished in Cloudy Gray, with contrasting stitching highlighting the S sport seats. The door sill trims are in aluminum and display e-tron logos; there are also e-tron badges on the gear knob and steering wheel. The trunk capacity is 280 liters (9.89 cubic ft); folding down the rear seats increases this to around 1,000 liters (35.31 cubic ft). With its Misano Red paint finish, the Audi A3 Sportback e-tron declares its sporty character at the very first glance. Its wheels have the characteristic e-tron design, with a 15-spoke look that evokes turbine blades. The chrome horizontal struts in the single-frame grille and air intake grilles have three-dimensional undulating profiles – another e-tron feature. The rear apron with new diffuser is also specific to the e-tron. The A3 Sportback e-tron demonstrates its full sporting potential when accelerating, sprinting and cornering at high speed. Its on-road performance is based on its sophisticated chassis, coupled with a low weight for a plug-in hybrid, despite its full range of equipment. Standard features include xenon plus headlights, convenient access, a panoramic tilting sunroof, a lighting package, the driving dynamics system Audi drive select, and MMI radio with extending monitor. 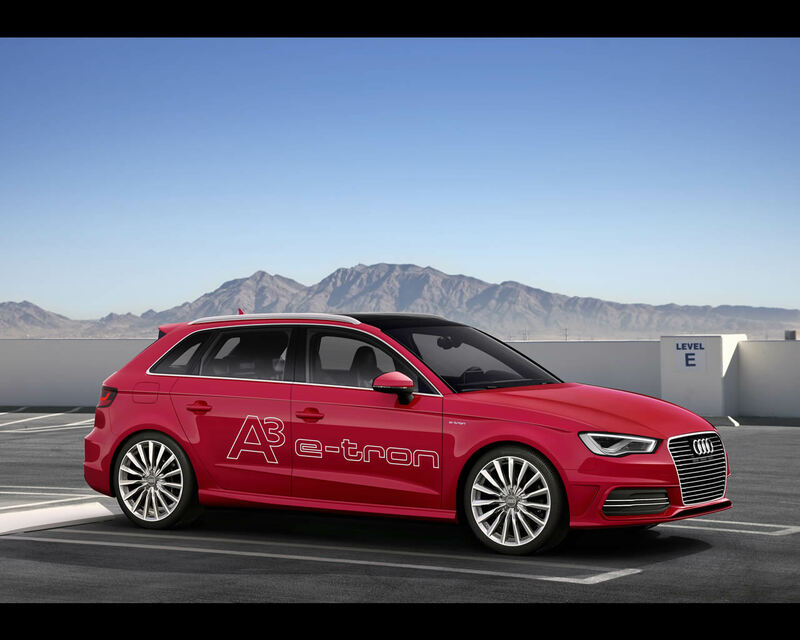 The Audi A3 Sportback e-tron provides a realistic glimpse into the future of mobility as Audi is planning it. The electrification of the drivetrain, above all using plug-in technology, plays a defining role in the strategy of the brand.